Cancer, Suicide and coping with Changes (with a big C), oh and mushy peas, of course. Changes are scary, that’s the conclusion I came to last week. I know that sounds a little trite, but I’ll explain what I mean. Last week I had a few evenings on my own, home alone and fancy free. I was tired most evenings, but the sense of stillness in the house gave me some thinking time. It also felt odd. I got around to thinking what it would be like if Jo never came back. if that was my life, going home to an empty place, making dinner for one. Maybe having a bath, reading a book and then some TV before bed. It felt weird to put myself into those shoes, but only because it was alien for me. I spend so much time running around. Owning a business is full of challenges, but one of those is not finding things to fill your time. Outside of work I have a few hobbies and a lot of friends, many of who I see on a fairly regular basis, or at least try to. Outside of that there’s the garden, house work and life admin. Its a pretty full life when you boil it down. Sometimes its good to get a little space to think and be alone, but only short term, or at least for me, I like people. Now if I didn’t have someone living with me, would that be bad? Well the three days was interesting as it felt weird, and weirdness or change takes you out of your comfort zone. if I were to suddenly be alone I’m sure that would feel weird for a month or three before I came to terms with it. Likewise other things take time to get used to and whilst you are getting used to them it feels bad, weird and other than normal. This is both a humans greatest weakness and source of strength. During the change process, be it getting cancer, losing a loved one, having a relationship end, or, indeed having a child things are tough. You try and reconcile your mind to what has occurred, and come to terms with it. These are big Changes, with a capital, not like a new washing powder or another grey hair, but big almost unfathomable Changes. Some take longer, some less time, but during that process they are very tough. Also you can’t compare with others on this, as my internal anguish at getting cancer is in no way comparable with someone losing a parent, or even just losing their job. Each person is affected differently by different levels of angst and its kind of irrelevant what others have gone through in the same vein, other than for kind words, as if it happens to you its much more real. No man (or woman) is an island, but on the other hand when you are going through something you are very much alone in a sea of whatever emotion you are feeling. people retreat like a wounded beast into the cave of themselves. No one else can understand, even if they have gone through exactly the same thing. You might have points in common, like a Venn diagram, but the emotions it kicks up are uniquely yours. That’s our greatest weakness. That’s why suicide is the biggest killer of young men. they feel so alone when they are lonely that some can’t take it. That’s why people feel low, take drugs and drink. They can’t take the change in their circumstances, how things have got so bad. With young men it is often loneliness or broken relationships. As a raging bundle of hormones and little experience of similar circumstances to tell you it will be ok in the end sometimes it seems the only way out. Its very sad, and when they are at their lowest ebb they need to be convinced, cajoled and persuaded that they can get through the hard times. Some few can’t, and depression is a very under recognised and unsympathetic condition. Another blog would need to be written on that. Aside from intense and paralysing depression people can learn to deal with these feelings and move on. That leads me to the greatest strength of humanity. Adaptability. People can deal with and move through almost anything, given time. Cancer, well it took me six-nine months to get to a point of acceptance. No doubt if it changes and my prognosis worsens I will find it tough again but I’ve adapted. I’m happy to talk about it to anyone and don’t feel discomfort if people ask me how it is. Being single from having someone, and getting used to not being able to rely on them can be tough too. But given time people can enjoy being footloose and fancy free, or even just get used to their own company. Watching what they want, doing activities which they don’t have to consult others about. Even if people aren’t quite as happy as they were before they do find equilibrium, a new normal. Arranged marriages are often horrible for the young lady, but they learn to survive and often are the most Even people like Stephen Hawkings learn to deal, because what else is there really to do? Once you rule out suicide, as you should (except maybe in cases of palliative care) then you have to endure, especially when others are relying on you. 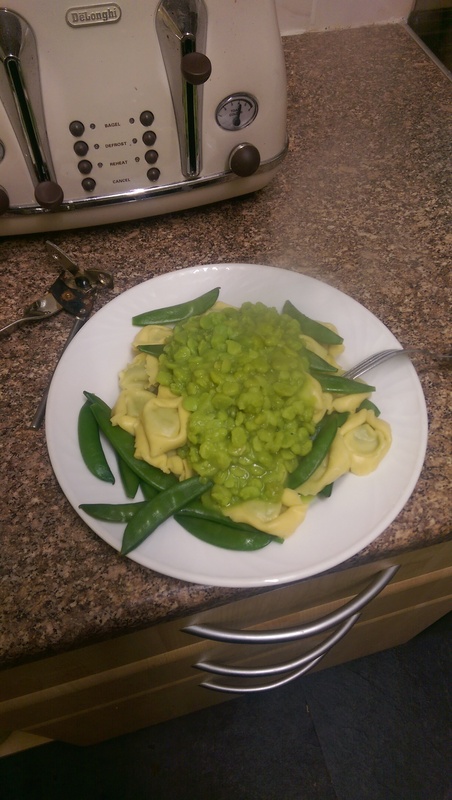 Anyway that’s what I was mulling over when I was home alone eating a rather abstract meal of mushy peas, sugarsnap peas and stuffed pasta. I was on my own, so ate what I wanted, please yourself 🙂 . Sometimes I wonder if I might be both a little peculiar and think too much, but you know what? I can live with that. A gourmet meal for one!